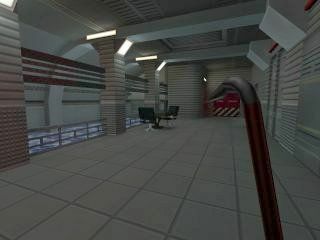 You are to create a post-disaster version of the provided base map by modifying brushwork, lighting, ambience etc. Well, we had a lot of rather good entries this time 'round. I highly recommend you check out all the other submissions if their authors have made them available in the Map Vault: they pretty much all had something interesting and entertaining in! Before I fired up this entry, I worried that I might have unfairly high expectations for an entry from SlayerA. No such fear: this was the only entry I actually had to re-play. 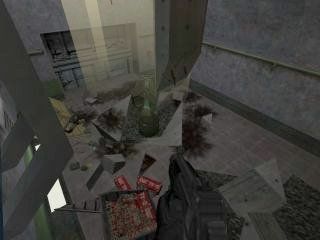 One of the most remarkable things I've ever seen in Half-Life. The rest of the map is rather similar to the base map provided, but the entity set-ups are quite incredible. First place, hands down. Another trophy for the inimitable SlayerA. Fantastic brushwork and attention to detail are the defining points of this entry. You'd almost think he'd coded in a little advanced fluid physics code. The only down point is that it's still clearly Black Mesa, but it's not much of a problem; it suits the little storyline. This was one of the more "from-based" entries: the place was completely, and nicely, re-textured. This one also had the most story, told quite interestingly. 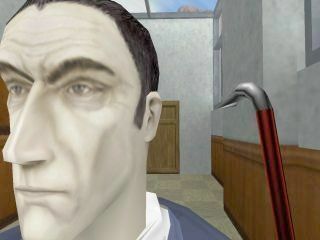 While it didn't have any particularly outstanding architecture, and a couple of little graphical bugs, it was also the only entry in which the G-man has the traditional position of power over the player. Processed in an excessively cute 610 milliseconds.